I was given an Easy Greasy to try and review. I'd never heard of it before Michelle offered to send me one, but as soon as I posted pictures of it on my Facebook page, a few friends immediately chimed in saying they had one and loved it. My sister even commented "best thing since sliced bread" so, naturally I was excited to try it. Their website says "Easy Greasy™ is a kitchen tool to make draining hot grease from food fast, easy and safe! Its patented design consists of a strainer that sits securely in a heat-resistant container. 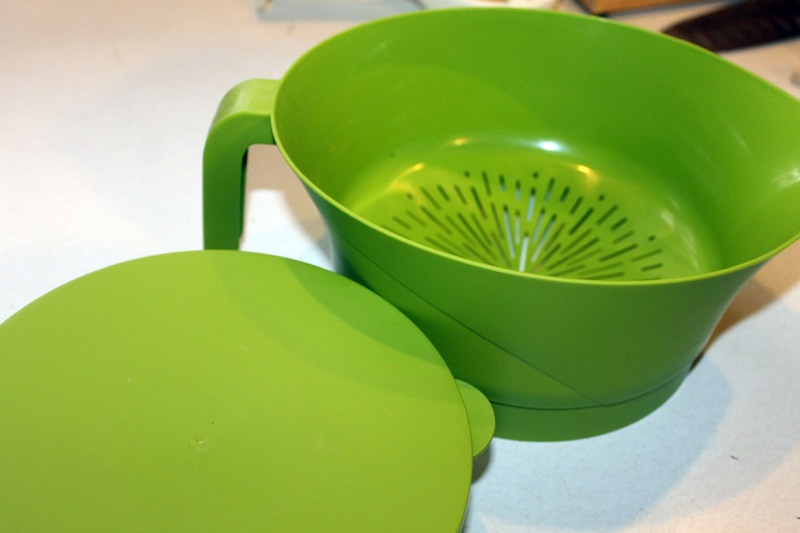 Simply pour cooked food into the strainer and allow draining. Then, remove the strainer and easily move your food to a pot or dish. 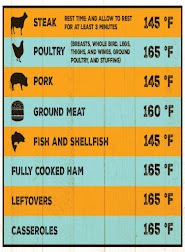 Your hot grease is safely contained! 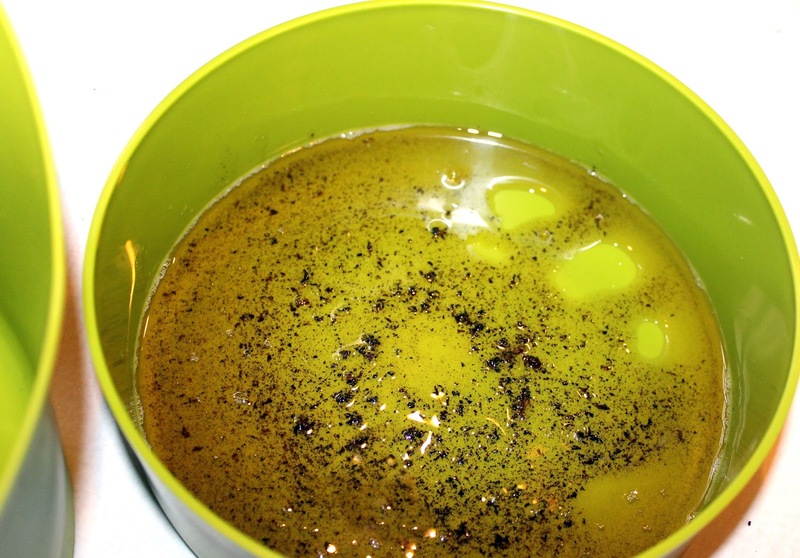 Once your hot grease has cooled, just scoop it into the trash or secure the lid to store it. It’s that easy!" 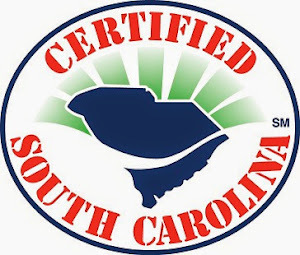 "Easy Greasy™ is designed to contain hot grease produced as a byproduct of cooked food, such as ground meat (like for tacos, meat sauce or beef nachos), bacon, sausage or other meats. 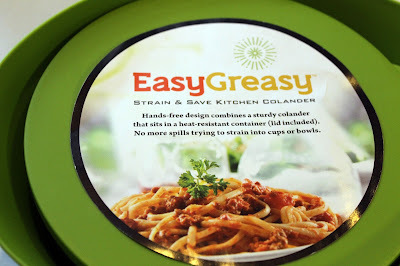 Easy Greasy™ is great for straining pasta or vegetables too! 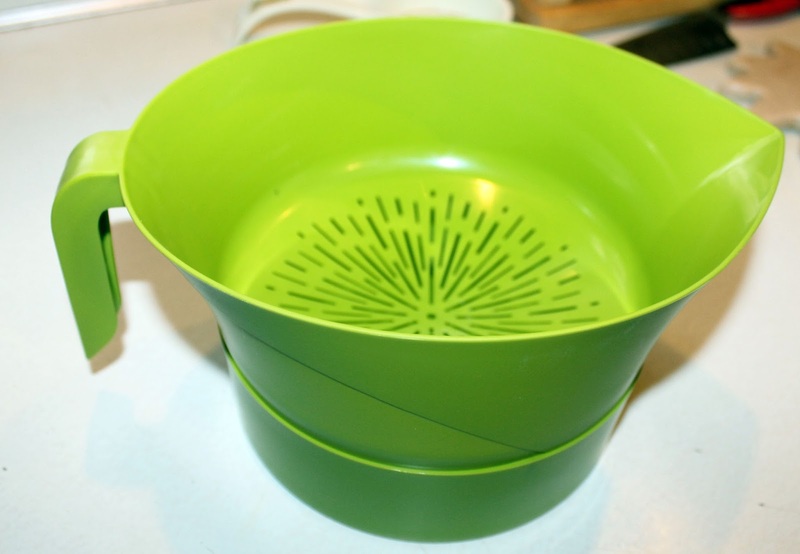 The Easy Greasy™ strainer can be lined with a cheese cloth for making jams or jellies." I tried it with bacon grease today and it worked just as they said it would. Then I took out a measuring cup and filled the bottom with water just to see how much liquid it holds, and it holds a whopping 4 cups. 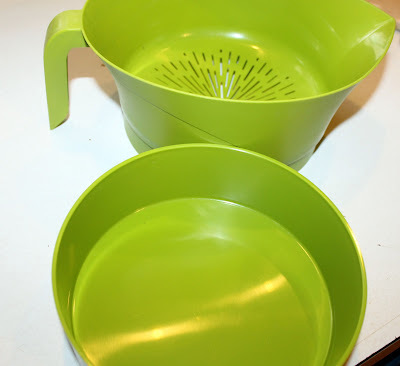 Four (4) cups is a quart which makes it the perfect vessel when I get ready to make some fruit jams this summer; simply line the colander with cheesecloth, place it on the bottom and pour in the fruit. This will be especially wonderful for straining the seeds out of blackberry or raspberry jam to make a seedless jam. I can also see the Easy Greasy coming in handy when I'm making a variety of sauces, because once they are cooked down, you strain the liquid from the solids, then I could store the sauce in the bottom section covered with the lid (provided) until I was ready to use it ... perfect! Easy Greasy would also be very helpful when making small batch veggie or chicken broth; easily stain the liquid while the bones, etc. you want to discard stay in the colander ... excellent! I'm sharing the Easy Greasy promo video here for you to watch, then be sure to enter my giveaway to WIN one for yourself!! Watch the Easy Greasy demo video below! Enter below to WIN an Easy Greasy of your own! Disclaimer - I received a free Easy Greasy to try and review. All opinions expressed herein are my own.